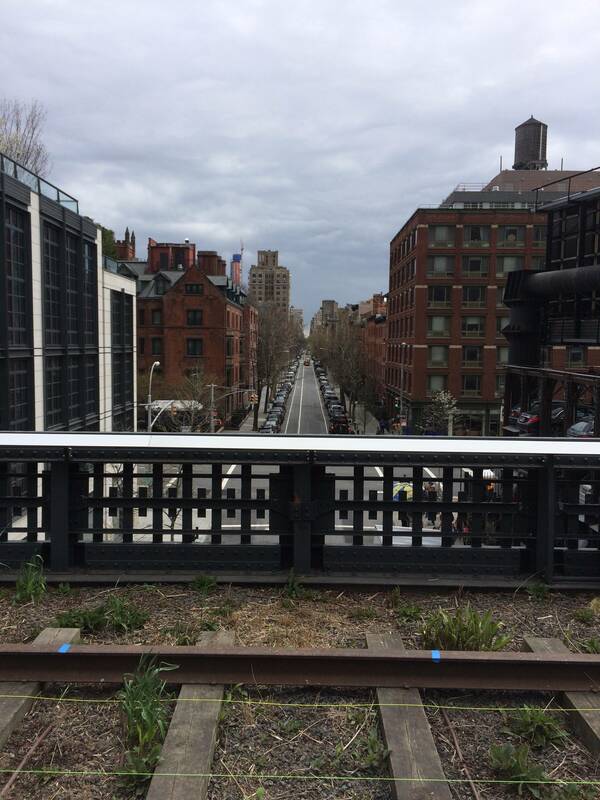 Cutting through New York’s ‘block system’, the High Line offers the perfect walk to experience this bustling city from a height. Passing through Manhattan, a key residential and corporate area on the West side of the city, the combination of cityscape with green space makes for the perfect ‘urban ramble’. Stunning cityscape Tiffany and Co. Foundation Overlook, 10th Avenue Square and Overlook (view down 10th Avenue), view down 20th Street, 26th Street Viewing Spur (crosstown views at West 26th Street), Chelsea, Manhattan , Northern Spur Preserve, New York Water Butts. Ranking: Most populous city in the US, 9th largest globally. ‘Type’ of city: A relatively ‘new’ one by British standards, but now a major metropolitan consisting of 5 boroughs. Chelsea: Adam Goldberg (actor, producer and director), Adam Horowitz (screenwriter and producer), Ashley Dupre (New York Post columnist), Calista Flockhart (actress), Cameron Diaz (actress), Elizabeth Berkley (actress), Harrison Ford (actor and film producer), Ira Glass (radio personality and producer), Jason Robards (actor), Kate Winslet (actress), Katie Holmes (actress and model), Kelsey Grammer (actor and comedian), Mathew Modine (actor), Nicole Kidman & Keith Urban (actress & singer/songwriter). Films/TV shots here:The film Manhattan (1979) included a shot of the line. The visible juxtaposition between the urban surroundings and the vast amount of greenery and forestry throughout this walk is what makes it so striking and special. Running right down the West side of the city, past the Hudson River, means it interplays with a variety of aspects found in Manhattan. Whilst the line now looks a little different today compared to its time as a railway, the maintenance of the track retains the history behind this old transport route. The interplay of so many historic features is a key strand of this walk. The history of New York’s transportation system began with the Dutch port of New Amsterdam. Through the 17th and 18th centuries produce was transported along the Hudson, with the creation the the Erie Canal. The canal, which opened in 1825, allowed ships to travel between cities as well as to Europe via the Atlantic Ocean. Whilst the first Industrial Revolution brought vast developments in road grids as well as improved links between New York and adjacent conurbations such as Brooklyn via the Brooklyn Bridge (built in 1870), the Second Industrial Revolution fundamentally altered transport within the city. The Erie Canal meant that port infrastructure grew rapidly and ‘elevated trains’ and the iconic ‘subways’ were developed around the turn of the twentieth century. One such ‘elevated train’ was the High Line; developed as a part of the West Side improvement project. It opened to trains in 1934 and ran from 34th Street to St John’s Terminal at Spring Street. For over 50 years the High Line was used as a part of the city’s trucking industry before the last train ran on the tracks in the 1980s. Following its neglect, ‘Friends of the High Line’ was set up by local residents of the neighborhood to advocate for the line’s preservation. In 1999, it was proposed that the route be used as a public space and by 2002, planning framework for its reuse had begun. As well as the evident history throughout this walk, development is also thriving and a big part of the urban scene you’ll experience throughout the walk. The walk will take you through and amongst all the up and coming life of the city from office developments to newly built apartments and bars. Whilst to an extent the presence of cranes and persistence of loud building machinery ruins the tranquility of the line, on the other hand, it is so key to this walking experience. It really highlights just how active this city is, forever expanding and improving. As a first timer to New York, It can be hard to know what to expect. Nervous about the prospect that this big city may fall short of expectations continuously laid out by Hollywood, you’ll be pleasantly surprised to find that it is everything you’ll have hoped for. Being in New York is like being on the set of a movie (pardon the cliché). You find yourself constantly pointing out familiar features and classically American sights. 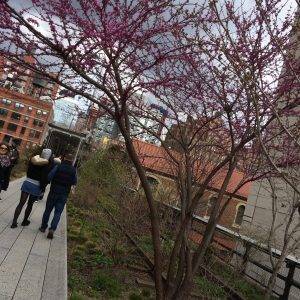 Being surrounded by the Hudson, it feels like an island, a country in its own right and The High Line is the perfect way to see it; situated 30 meters above the ground you really get to appreciate it from a distance. It’s the perfect opportunity to look down on the chaos you’ll shortly have to return to. 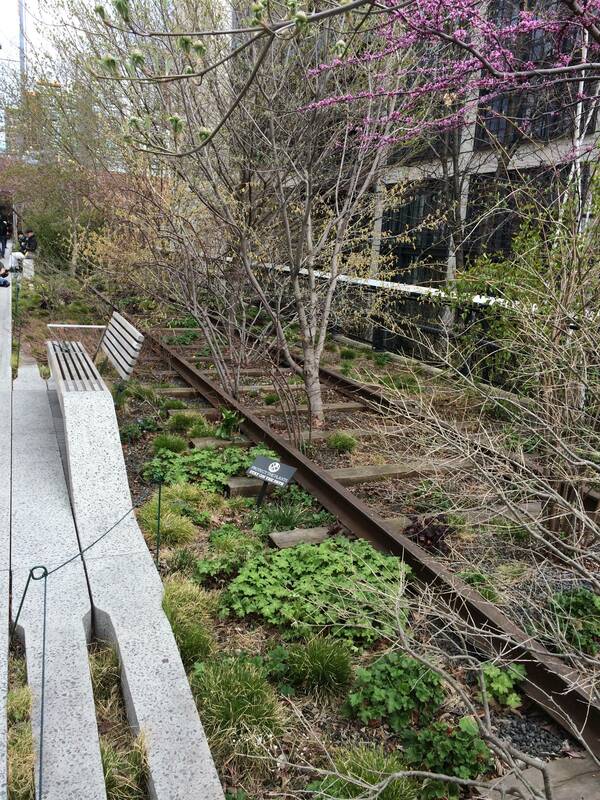 Before entering The High Line at 34th Street, you’ll find yourself at the CSX Transportation Gate. Named after the international transportation company CSX, this first part of the line was donated to the city by the company back in 2012 in order for them to continue the transformation of this public space. The section was originally built in 1934 to carry freight trains but was donated to the city as a display of their support for the line’s transformation. Following the line round and off of the CSX section, you’ll walk onto the Interim Walkway, a simple bonded aggregate path through self-seeded plantings. The line’s planting design was inspired by the self-seeded plants that grew over the structure following the track’s retirement in the 1980s. With different seasons bringing new breeds of plant, be sure to visit their website prior to your visit for a list of things to spot. The Walkway highlights the views across the Hudson River to the West and of the city itself. The stunning view of the river below the skyline of the city provides a perfect opportunity for a photo before rounding the corner overlooking 30th Street. Moving away from the river, parts of the line have been covered in recent years in an attempt to make the walk appealing in all weathers. The arched, weatherproof covers are transparent, channeling you along the line protected whilst allowing nothing to be missed outside. Reaching just West of 11th Avenue, you reach the Perishing Square Beams. the line’s concrete decking is stripped away to reveal the steel structured beams below. The gaps around and beneath the beams allow children to explore the areas beneath the surface of the line and the beams themselves have been silicone coated for safety. Not for the tall amongst us, however, the bare metal structures are a reminder of the industrial past of the line, a bit of restored history. Moving on towards 26th Street you’ll come across the 26th Street viewing spur, hovering above the historic rail on the east side of the highline. The spur’s frame is meant to recall the billboards that were attached to the highline in order to block it from view from the city below. Today, the frame offers stunning views East down 10th avenue and over Chelsea, surrounded by shrubs, trees and wooden decking. Take a seat on the in-built wooden benches and enjoy the view! A few metres on from the viewing spur at West 25th Street, the line rises up 8 feet from the structures surface for three blocks at the Phillipe A. and Liza Maria Falcone Flyover. Across a grated metal pathway, the Flyover allows you to walk through a mass of bigleaf magnolia, sassafras and serviceberry trees at canopy level. Take a look at the groundcover plants blanketing the ground below as you’re are carried upward. 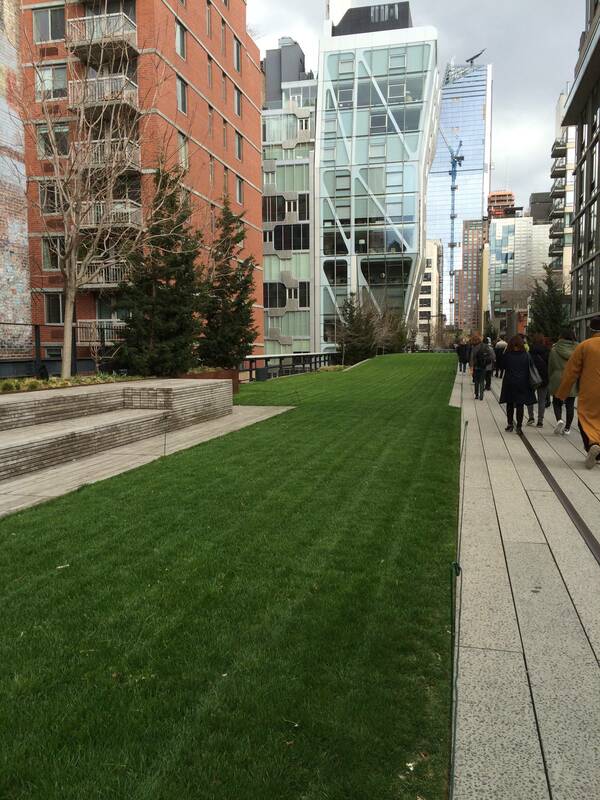 The High Line’s only lawn and main ‘green space’ is the 23rd Street Lawn. This 4,900 square-foot lawn stretches for an entire block from North of West 22nd Street. It’s formed on an area where an extra pair of tracks once served as the loading docks for adjacent warehouses. A gathering space has been created, perfect for picnics or just a quick pit stop with seating steps made of teak surrounding the grassed area. At points, the lawn has been made to ‘peel’ away from the surface lifting you several feet in the air for a view of the Hudson River and New Jersey to the West. My favourite part of the walk has to be the 2-block long, Chelsea Thicket between West 20th and 22nd Streets. As you move North away from Chelsea denser areas of flower and shrub plantations indicate a new section of the line. 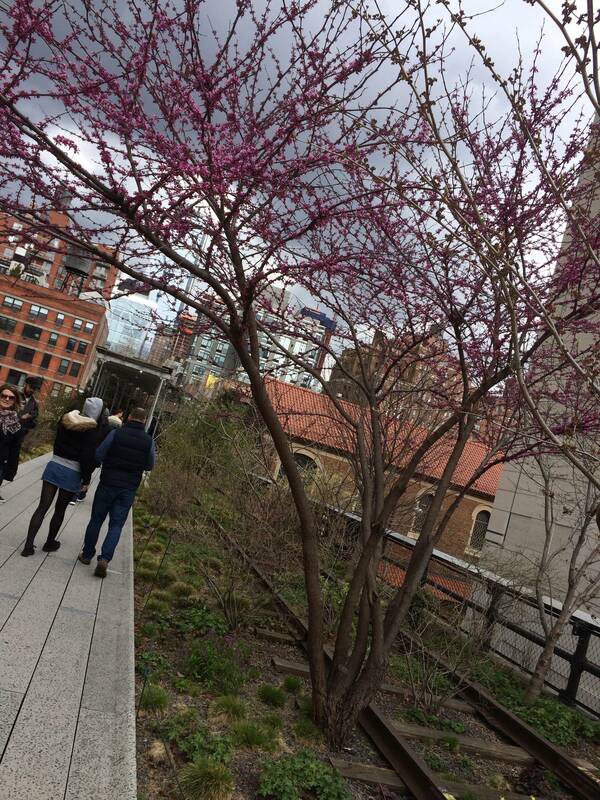 The flowers surround the pathway which runs parallel to the original railroad tracks, a further reminder of the underlying history of the High Line. Be sure to look out for flowering species such as winterberry, red bud, blue moon and Pennsylvania sedge, some of which provide year-round colour to the thicket. Iconic New York water butts can also be seen frequently around this area of the walk. Look up to see the butts, an iconic part of a New York skyline. 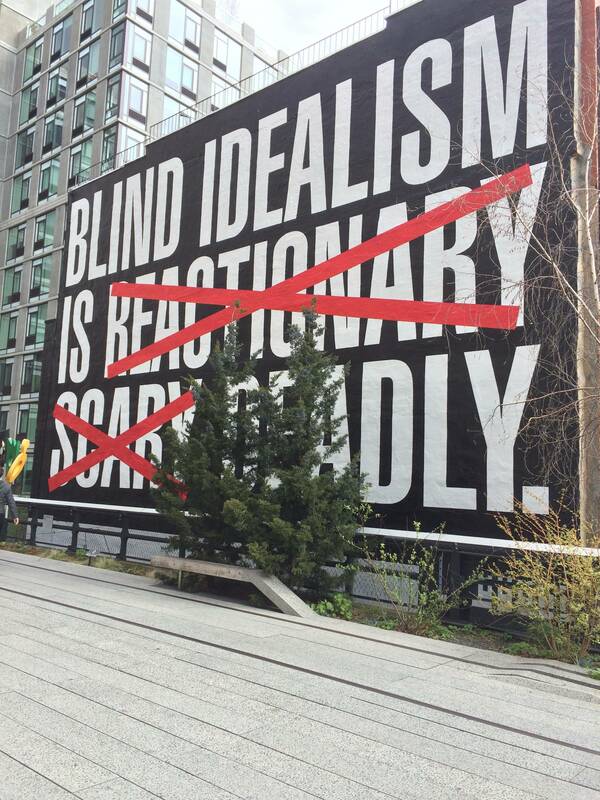 Heading away from the thicket and towards 10th Avenue Square and overlook, on your right hand side Barbara Kruger’s ‘Untitled (Blind Idealism Is..) piece stands adjacent to the line at West 22nd Street. The piece is a hand painted mural displaying her unabashed criticism of culture and power. The quote is an adaption of a quote from Afro-Caribbean philosopher Frantz Fanon whose original statement “Blind Idealism is reactionary” is stroked out. 10th Avenue Square and Overlook around 17th Street overlooks 10th Avenue to the North and the Hudson River to the South. On clear days, the Statue of Liberty can also be viewed from the amphitheatre like stand that has been created. The stand was created after many of the structure’s beams were removed to create this public space. Note also that just off the line here, 16 minutes on foot at West 17th Street the Rubin Museum of Art can be found. Featuring collections from the Himalayas, India as well as Tibet – for the arty amongst you it’s worth the walk. 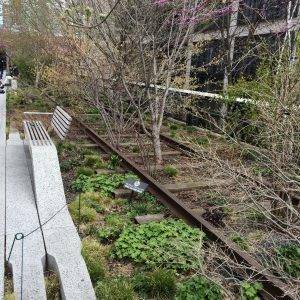 A little way on and you’ll reach the Northern Spur Preserve at West 16th Street, a horticultural preserved spur thst splits off from the main line and crosses 10th Avenue across to the former Merchants Refrigerating Warehouse. A non-slip aluminium ramp has been installed to allow access onto the spur. Stepping onto it you’ll be surrounded by landscaping designed to recall the self-sown vegetation which grew up over the line after the trains stopped running. Almost 7,500 native grasses have been planted. 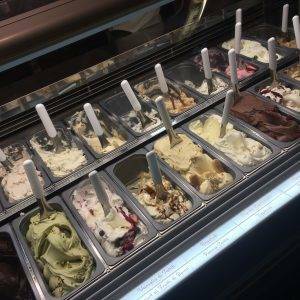 If you’re getting a little hungry or just in need of a stop off this is the perfect place. 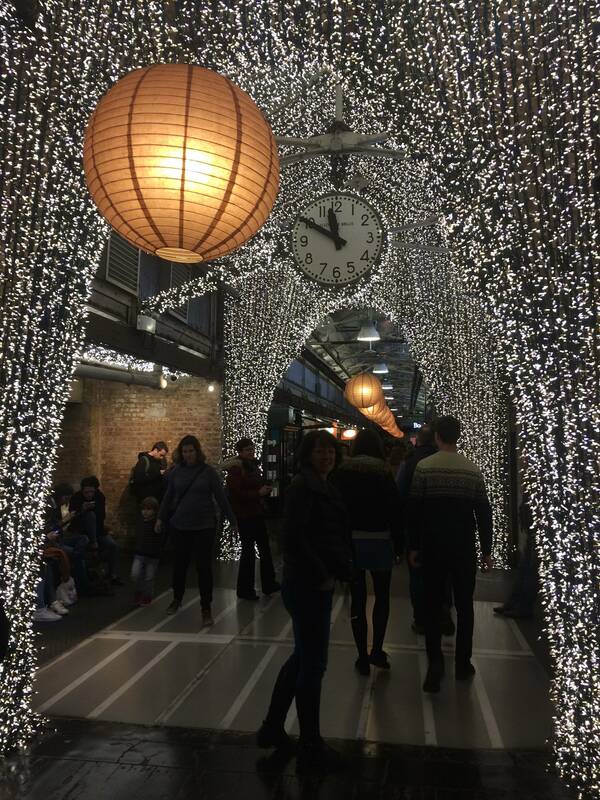 During the warmer months of the year the Chelsea Market Passage features local art and neighbourhood programmes as well as gourmet food carts and an open-air café. 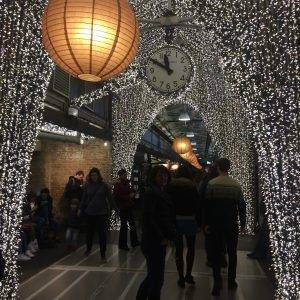 However, if you’re visiting later in the year, Chelsea Market itself is just a 3-minute walk from the line and well-worth a visit. 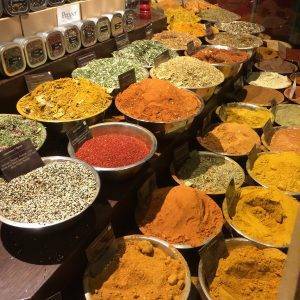 Within the Meatpacking District, Chelsea Market is a block long food hall with more than 35 vendors offering everything from Paninis to pancakes and cheese to cheesecake. For a great New York Style sandwich with sourdough bread and fresh ingredients, ‘Friedman’s Lunch’ provides a buzzing café environment at the heart of the market. 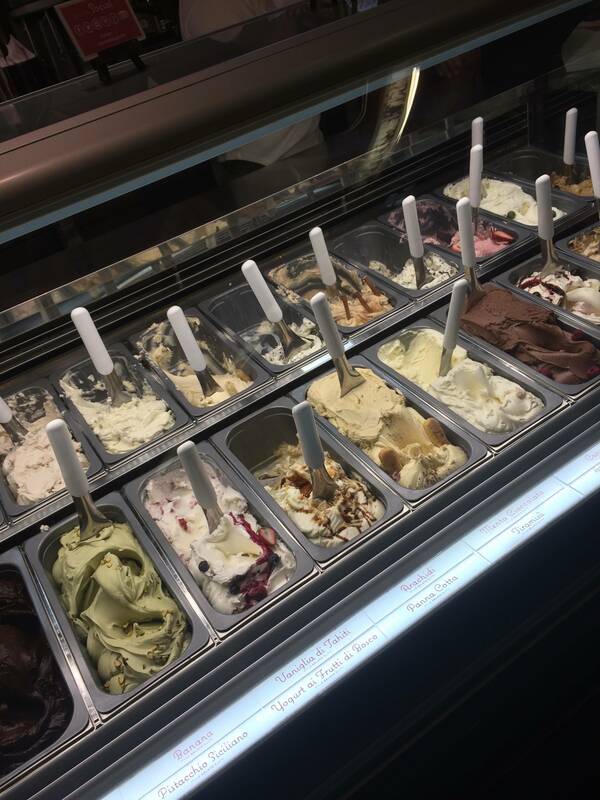 Yet, if you’re looking for something a little sweeter look no further than ‘L’arte del Gelato’, a producer of artisanal gelato in flavours from peanut butter to traditional strawberry. Like the line itself, the market has a vast history as an ex-factory of the National Biscuit Factory and in an area originally used by the Algonquin Indians who traded their game and crops on the site of the market itself. 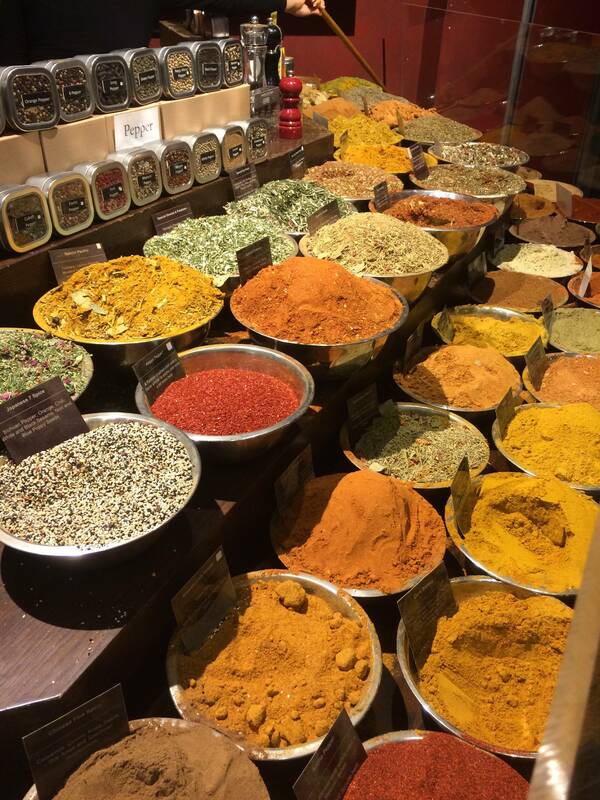 The factory itself was in fact where the Oreo Cookie was developed and first made.. so if you’re a die-hard foodie or just a tourist with an interest in the history and a stop along the way – the Chelsea Market is definitely the place to go, plus, you won’t go hungry! The Diller – von Furstenbery Sundeck and Water Feature is a pathway between West 14th and West 15th Street. Surrounded by benches and flowers poking though the cracks in the structures (look out for snowdrops around March and April), a water feature allows visitors a chance to dip their toes during New York’s warm springs and summers. Moving towards the end of the walk, the 14th Street Passage is a semi-enclosed passage created as a public space for public programs and art screenings. The art screenings, presented by High Line Art, take place at various parts of the year and include art videos, historic works, new productions and curated series. To avoid missing out, be sure to check dates before you visit. 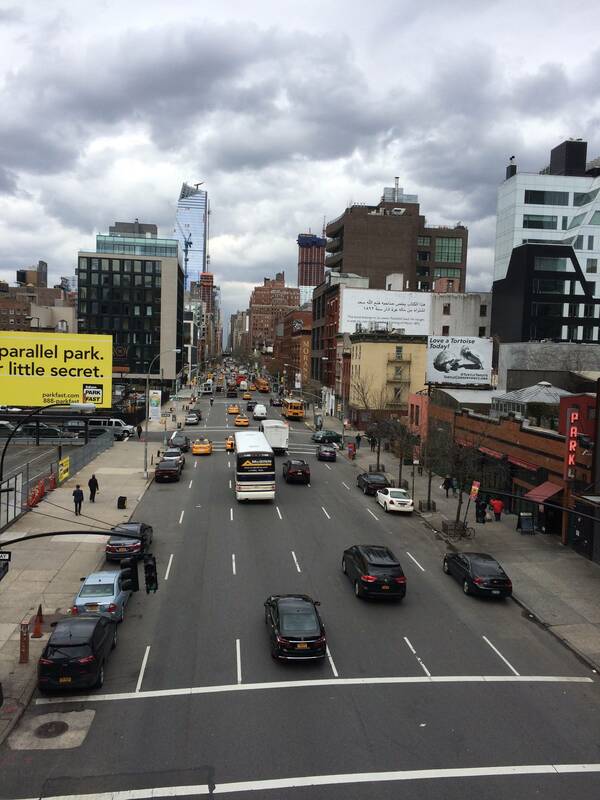 The walk concludes on Gansevoort St. at the Tiffany & Co. Foundation Overlook, a balcony looking east over the Meatpacking district. The balcony marks the point at which the High Line was cut off from the remains of the track back in the 1990s. Whilst the High Line itself was restored, south of Gansevoort Street the lines were demolished. As well as looking over the Meatpacking District, the overlook offers views westward of the newly opened Whitney Museum of American Art. Like the Rubin Museum, the Whitney Museum of American Art is the perfect stop for art lovers. Typical time: 45 minutes – 2 hours (depending on stops made and features seen). If you’re not within walking distance of the line and haven’t already done it, catch the Subway. It’s all part of the New York experience. Once underground, head towards West 34th Street and on arrival take a right out the station towards the CSX Transport Gate. This is the main access point for the Interim Walkway, the only place where the line descends to street level, allowing for wheelchair access. Follow the line round to the left and onto the Interim Walkway. Reaching West of 11th Avenue, walk towards the Perishing Square Beams. Walk towards 26th Street to the 26th Street viewing spur. Walk two blocks down towards West 23rd Street and you’ll find the 23rd Street Lawn – at 4,900 square foot it’s hard to miss. Three blocks on, between 20th and 22 and street, the Chelsea Thicket. For the Rubin Museum of Art, exit the line at the 18th street exit. Follow 18th street for half a mile. Take a right on 7th avenue, heading South. Follow 7th avenue for 160 yards before taking a left on West 17th The museum is on your right. For Chelsea Passage, continue on the line. For Chelsea Market, exit the line at 16th street exit. Take a right and walk down West 16th Street heading SE. At 9th Avenue, take another right to number 79. Continue heading west on the line until you reach between West 14th and 15th. Here you’ll find the Diller – von Furstenbery Sundeck and Water Feature. Continue on for 14th street passage. 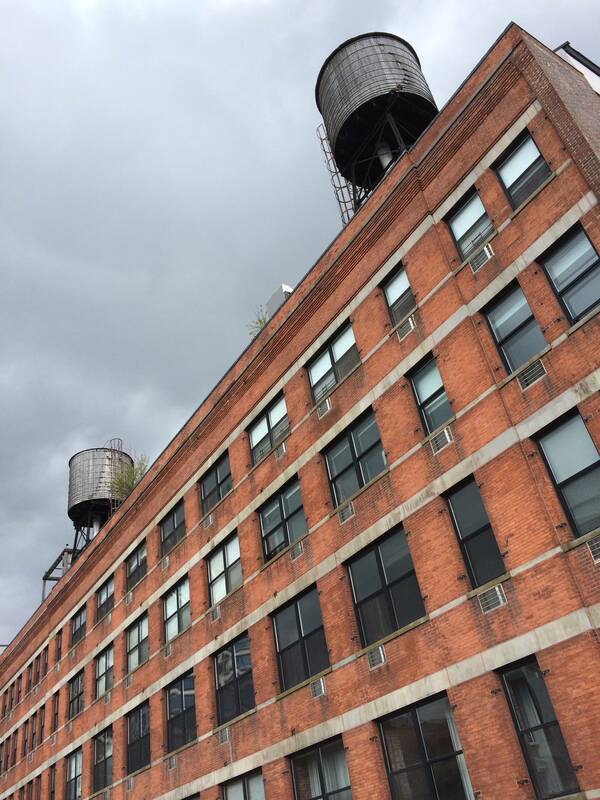 At the end of the line, the Tiffany and Co. Foundation Overlook can be seen just off Gansevoort street. (www.thekitchen.org, +1 (212) 255-5793) A non-profit art and performance space featuring a variety of music and drama productions.